Now that the Summer of Code is over, it seems like the proper time to give an overview on the state of debugging information in Rust and to talk a bit about what I was able to accomplish this last three months. In order to make this an interesting read for you, I thought it might be a good idea to combine this with a guide on how to use the new features in your projects. 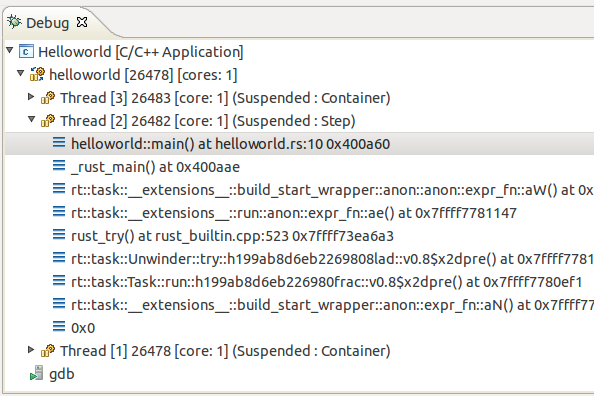 The main goal of my GSoC project has been to make rustc produce (more) DWARF debug symbols for its executables. DWARF is a standard format for describing debug information for various languages. An executable containing debug symbols in this format can be run in different debuggers―most notably GDB and LLDB. Now, command-line debuggers like GDB and LLDB are definitely excellent tools providing a lot of useful functionality and doing a lot of heavy lifting in handling executables and interpreting debug information. But using them through the command-line can be a bit cumbersome. A graphical user interface usually provides a better overview of the situation where one can find out what’s going on more quickly. 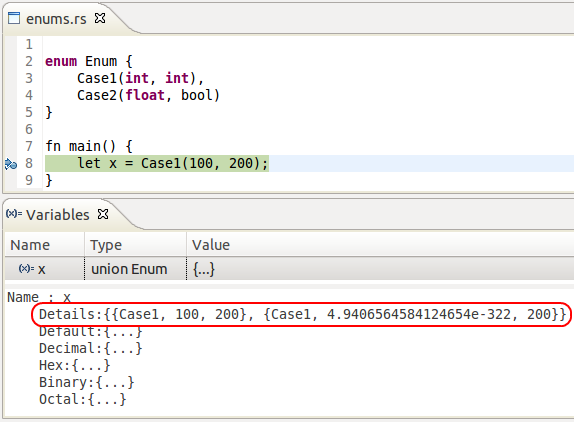 For this reason (and because it makes for better screenshots :) I’ll briefly describe how to debug Rust programs using Eclipse as a GDB front end. First we’ll need an Eclipse instance with C/C++ Development Tools installed. 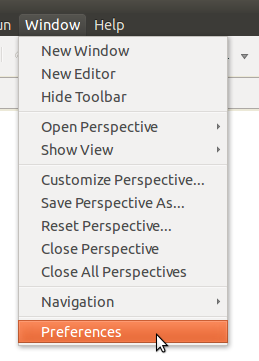 I simply used a fresh install of the latest version of Eclipse IDE for C/C++ Developers. 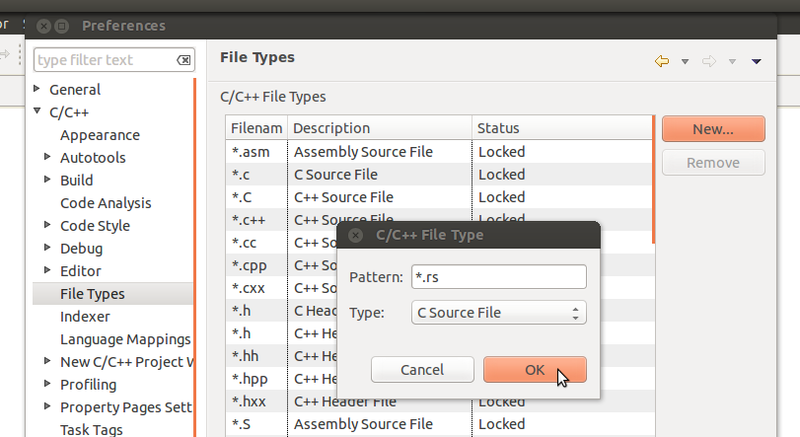 add the pattern *.rs as C Source File. Otherwise the debugger might break in some internal runtime function also containing the string “main” and then tell you that it can’t find the source file for this code position and you won’t know what the heck is going on. We don’t want that. This is kind of a quirk and I hope to find a nicer solution for this in the future. Luckily, most of the time we’ll just set breakpoints somewhere in a source file and won’t have to deal with this. 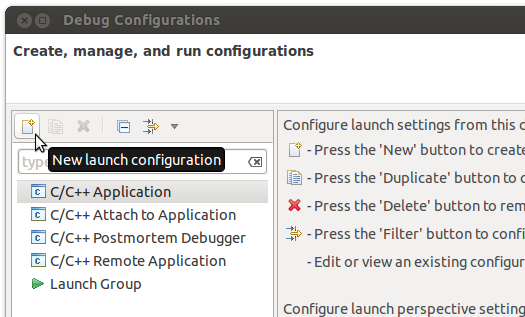 Other than that we are ready to go: Click Apply so this configuration can be used later on and then click Debug. Since it’s so handy, typical Rust code contains lots of variable destructuring, so it’s important to get this right. Fortunately, there’s no real problem here: There is only a syntactic difference between Variables declared with destructuring and normal ones. The debugger/DWARF is only interested in the variable’s name, type, memory location, scope, all things also available for variables declared as part of a pattern. This is implemented since pull request #8045. One can still find out what the correct value/interpretation is, the discriminant value is always displayed correctly―but pretty is something else. DWARF, in theory, supports discriminated unions (see 5.5.9 Variant Entries in version 4 of the standard) but LLVM does not support this and GDB only does in Ada mode. In the future a GDB pretty printer might improve the situation here―I am not sure, however, how well this plays together with something like the Eclipse front-end. You will probably experience some odd jumping around in the code at times while stepping through the code. This is because some machine instructions are linked to wrong source code positions. These problems don’t become visible in the automated tests and have thus long gone unnoticed by me. This should be fixable with some fine tuning in code generation. The self argument in methods has some special handling in the trans module and is treated differently from other function arguments. Debug info adds some special requirements which are not met for by-value self arguments. There is no principal problem, just some code untangling that needs to be done before this can be implemented. This is something I have not tried even once :) It may work for simple cases. It definitely won’t work for anything involving dynamic dispatch. There are some open issues regarding DWARF namespaces (which in Rust can be introduced by crates, modules, functions, traits, and impls). In particular, you’ll sometimes get warnings about namespace nodes not being found for some item or other (e.g. #9167). Namespace support is in for a refactoring which should also make this a non-issue. There are a few things that could be described more accurately in the debug information, especially regarding generics (#9224, #8641) but also things like struct member visibility (#9228). These should definitely be addressed some time in the future. 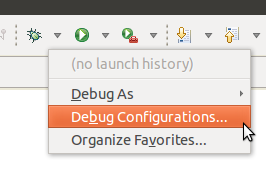 But as they don’t interfere with the regular debugging experience I’d regard them as rather low priority. After the issues above are resolved there are some things on my wish list that would further improve the debugging experience and implementation stability. One thing that might make sense is to directly test the generated DWARF data. At the moment the automated tests consist of small programs being run through GDB and we check if GDB reads out correct variable values at given breakpoints. This approach is a very good idea and we should continue to have these tests. But some things, like namespaces, are hard to test this way. There are libraries like libdwarf or pyelftools that allow to inspect the debug information contained in a binary. Test cases that directly check whether the DIE-structure for a given program looks as expected could then act as a kind of active specification of how to describe Rust programs in DWARF. Another thing on my wish list are GDB pretty printers. These would allow to display values as they appear in Rust as opposed to C. This would be especially nice for enums which―as mentioned above―have rather ugly output at the moment. But also functions, tuples, vectors could profit from this. By far the most ambitious project would be a real, native Rust debugger and adoption of Rust into the DWARF standard. Both are probably more feasible than they seem at first sight. DWARF already supports most of what’s needed for Rust. A few type modifiers for e.g. ~ and @ would be nice, also having special tags for traits and tuples. But these should not require much more than adding some DW_TAG_* constants to the standard. The more complicated things like discriminated unions are actually already in place. Since this is a kind of GSoC-conclusion post I want to take the time to thank my GSoC mentor Josh Matthews who has been of great help the whole time. Thanks Josh! :) I also want to thank Brian Anderson and Graydon Hoare for their encouraging comments and the rest of the Rust community for being awesome! And of course thanks to Google for organizing this program―keep it up!